After posting minimal decreases, and facing minimal competition, Sony's Jumanji: Welcome to the Jungle has proven to be a box office hit, winning the last three weekends in a row, although that streak is likely in jeopardy with the release of 20th Century Fox's The Maze Runner: The Death Cure. This final installment of The Maze Runner trilogy, which follow the young group known as the Gladers trying to take down the organization known as WCKD, is poised to topple Jumanji, while Entertainment Studios' Hostiles will be expanding nationwide and could make a sizeable dent at the box office. We're predicting that the Gladers will finally take down the gamers of Jumanji, opening with a solid $26.1 million this weekend, which continues the slight downward decline of this franchise. The first two Maze Runner movies weren't massive hits at the box office, but both were solid performers, putting up rock hard worldwide grosses against minimal budgets. 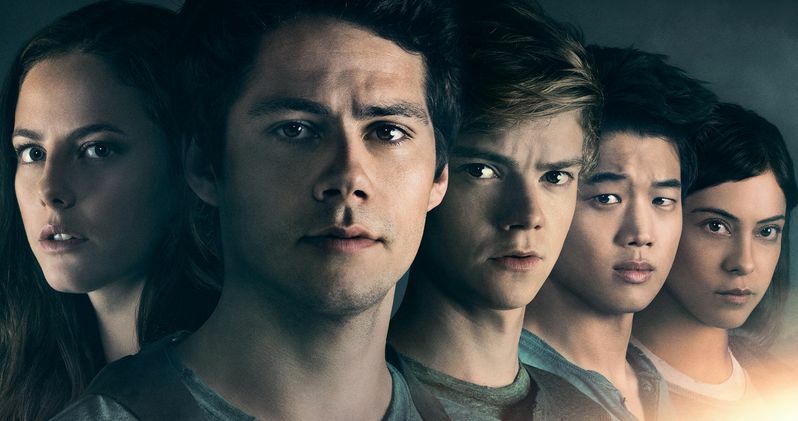 The Maze Runner, which introduced movie fans to Dylan O'Brien's iconic Thomas character from the James Dashner novels, hit theaters in the fall of 2014, opening with a decent $32.5 million en route to $102.4 million domestic and $348.3 million worldwide, from just a $34 million budget. The Maze Runner: The Scorch Trials hit theaters almost exactly one year later in the fall of 2015, opening with $30.3 million, en route to $81.6 million domestic and $312.3 million worldwide, from a $61 million budget. 20th Century Fox had originally slated a February 2017 release date for The Maze Runner: The Death Cure, but the project was delayed a year after a tragic accident. Shortly after production began in March 2016, Dylan O'Brien was severely injured on set, after a motorcycle stunt gone awry. The actor suffered a facial fracture and several lacerations, with production originally scheduled to resume that May, but filming didn't resume until February 2017, giving the actor more time to fully recover from his injuries. That lead to the studio delaying the release date by nearly a year from February 2017 to January 12, 2018, before being shifted to February 9, 2018 and then finally to its current home on January 26, 2018. Our projected $26.1 million debut represents a continual decline for the franchise, especially considering how much the film was delayed. It's also worth noting that The Death Cure is only at 49% on Rotten Tomatoes, although it remains unclear if these mixed reviews will have any impact on the box office. The Maze Runner started the franchise off on a Fresh note with a 65% rating, although the sequel The Maze Runner: The Scorch Trials seemed to rub critics the wrong way with a 46% rating. With a few more days left until The Death Cure hits theaters, it will be interesting to see whether this franchise finale will improve its rating, or continue to slip even further. We're predicting that the top 10 will be rounded out by Jumanji: Welcome to the Jungle ($11.2 million), 12 Strong ($8.7 million), Hostiles ($7.3 million), Den of Thieves ($7.1 million), The Post ($6.3 million), The Greatest Showman ($6 million), Paddington 2 ($4.1 million), The Commuter ($3.8 million) and Star Wars: The Last Jedi ($3.1 million). Also debuting in limited release is Reliance Entertainment's Aiyaary, Parade Deck Films' Desolation, Strand's Have a Nice Day, Well Go USA's Kickboxer Retaliation, Vertical Entertainment's The Neighbor and Sony's Pad Man. Looking ahead to next weekend, the month of February kicks off with just one new movie in wide release, Lionsgate's Winchester: The House that Ghosts Built, with Vertical Entertainment's Bilal: A New Breed of Hero, IFC's Cage Fighter, Sony Pictures Classics' A Fantastic Woman and Cinedigm Entertainment's Scorched Earth arriving in limited release. Take a look at our predictions for the top 10 below, and check back on Sunday for the top 10 estimates, courtesy of Box Office Mojo.